Q. How do I search for letters to the forum in Straits Times? What about advertisements, page numbers or illustrations? Try NewspaperSG - full-text up to 1989. It has also search results up to 2008/9, to confirm existence of item before heading to the microfilms. For periods after that, use Newslink database to the confirm existence of item before heading to the microfilms. Factiva does not include page numbers for Straits Times, so if you get the digital copy off there you don't really need to cite the page number. NewspaperSG - full-text up to 1989. It has also search results up to 2008/9. Use this to confirm page numbers. For periods after that, use Newslink database to the confirm page numbers. LexisNexis Academic also has some page numbers. You will be able to see results from 1845-2006 but full-text is available for free online up to 1989 only. This allows you to search for letters to the forum from roughly the 1990s onwards to current day. Not all letters will be found in this database. First, Click on News (on left). Then click on All News. 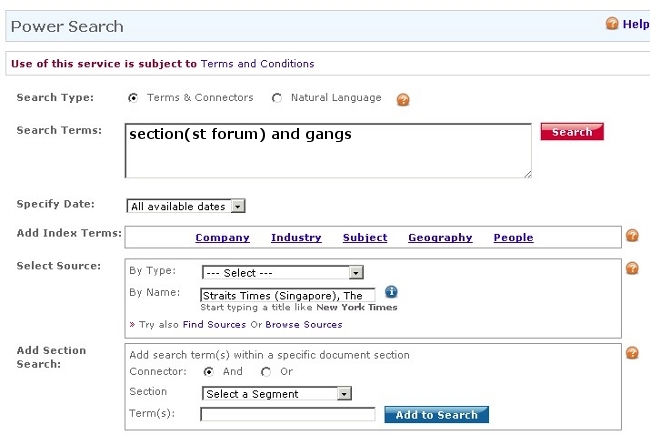 Then click "Edit in Power Search"
In select source : Search for Straits Times and select the appropriate source. This is how it will look like when done. Alternatively you can also try this which will get you online letters. We don't subscribe to the Newslink database , but you can use this to search for a maximum range period of 2 years to find the letter you need before going to the Microforms Collection. Simply do a search and under Section , refine to Forum (click more if necessary). 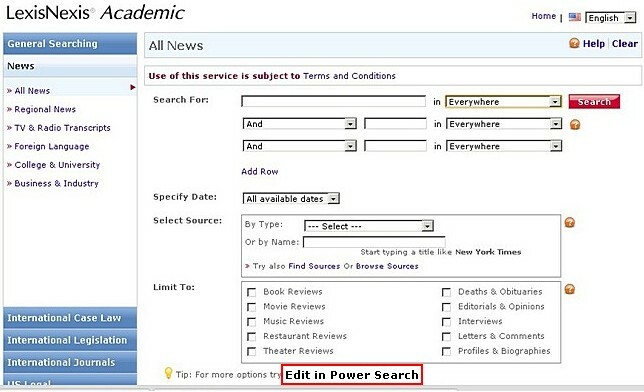 If you cannot find what you are looking for in either sources, you may have to search for it in the Microforms Collection.